Rushed to Ion Orchard after work yesterday. 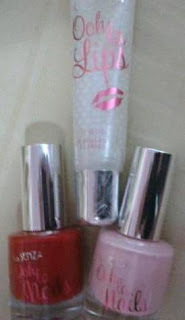 Bought the new La Senza Prestige VIP Card at $29. Used this card to buy the set of nightwear which I was eyeing 2 days ago, 2 nail polishes and a lip gloss. Watched "Chalet Girl" with KZ at Shaw Lido. 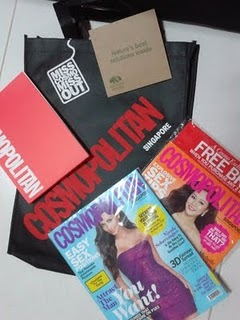 Got a tote bag with the first issue of Cosmoplitan Singapore, Origins facial voucher and a notebook. Finished a regular-sized popcorn by myself. Ed Westrick is not bad-looking based on his cool image. Walked to FEP for dinner. Chee chiong fun with prawn at $3.50.